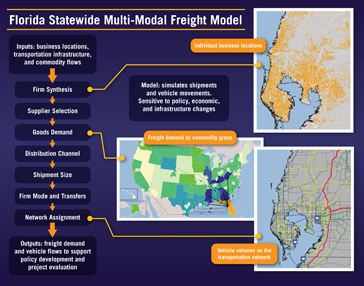 Florida Statewide Freight Model | Resource Systems Group, Inc.
RSG is developing a multimodal statewide freight model for Florida that uses logistics supply chain models to forecast freight movements on a national scale, focusing on the movements into, out of, and within Florida. RSG developed a freight forecasting framework that combines tour-based truck models and logistics supply chain models for commercial vehicle movements for the Federal Highway Administration, which is the basis for this project. The project focuses on the development of the supply chain model to support multimodal statewide freight modeling, but also discusses the linkages between that model and regional tour-based truck models (which are not part of the project) that could be implemented in Florida at a regional level and integrated with regional travel demand models. The project will involve model development, model integration, calibration, and validation. The supply chain models use an open source (R) program integrated with the passenger travel demand model within the Cube modeling platform.